Fun ways to discover and understand the animal world! As special places for learning all about wild animals, zoos play a fundamental educational role. La Barben zoo is committed to helping its visitors to understand, respect and protect wild animals and their environment. As part of this commitment, the zoo offers a variety of tools designed for pupils of all ages to discover the animal world and raise awareness of the need to protect the environment. 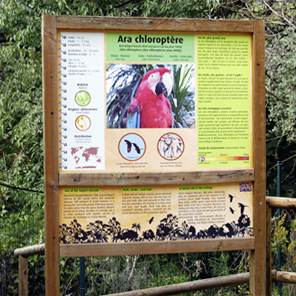 Placed next to every enclosure, these panels provide information on the animals and their conservation. Discover the secrets of a variety of fascinating animals: lifestyle, diet, behaviours… These sessions are an opportunity to observe, discuss and learn, with the family or in a group. Animals and times: in the events diary on our website or when you arrive at the zoo. School groups are offered ‘meet the keeper’ sessions throughout the year. Please request this when you book. A practical suggestion: the picnic basket! If you want to travel light, we can provide a picnic basket for you! Please place your order 48 hrs in advance, by fax on 04.90.55.79.08 (please note, the number of picnics ordered will be the number invoiced). Designed for schoolchildren (from nursery to middle school), these workshops cover a range of animal-related themes in a clear and fun way and aim to raise awareness of environmental issues and eco-responsibility. A number of subjects are offered, in line with the school curriculum: diet, classification, the threats facing animals in the wild, the work of the zoo… To take part in these workshops, places must be booked in advance with our education department. We offer a series of open days to help you prepare your visit. One of our education officers will show you the various options and tools available to you and answer any questions you might have. You will also be given time to explore the zoo. These days are free of charge and exclusively for teachers, who must book in advance. Please familiarise yourself with our visitor regulations as all ages are asked to comply with them!